The aim of the study was to identify the thermal and precipitation conditions and their changes in the growing season in Poland in the years 1966–2015. Data on average daily air temperature and daily precipitation totals for 30 stations from the period of 1966–2015 were used. The data were obtained from the collections of the Institute of Meteorology and Water Management—National Research Institute. The growing season was defined as the period of average daily air temperature ≥ 5 °C. The mathematical formulas proposed by Gumiński (1948) were used to determine its start and end dates. In the growing season in Poland in the years 1966–2015, there were more significant changes in the thermal conditions than there were in the precipitation conditions. In terms of long-term trends over the study period, thermal conditions during the growing season are characterised by an increase in mean air temperature, an increase in the sum of air temperatures and an increasing occurrence of seasons classified as above-normal seasons. Precipitation conditions of the growing season show large temporal and spatial variations in precipitation and a predominance of normal conditions. The changes in precipitation were not statistically significant, except for Świnoujście. In recent years, an increase in the average global air temperature has been observed. In the northern hemisphere, the 1983–2012 period was probably the warmest 30-year period in the last 1400 years (IPCC 2013). One consequence of the increase in air temperature is an extension of the growing season in Europe, which results in changes in the phenological stages of individual plants (Menzel and Fabian 1999; Chmielewski and Rötzer 2001; Chmielewski et al. 2004). In the coming years, the length of the growing season in Poland is forecast to increase. Nieróbca et al. (2013) indicate that, by 2030, the growing season in central Poland may have increased by 10–14 days over its length during the reference period 1971–2000 and, by 2050, by 18–27 days, while in south-western Poland, those increases are forecast to be 11–17 days and 22–30 days, respectively. A similar trend is predicted by Skaugen and Tveito (2004) for Norway by 2050. Changes in thermal conditions may, however, also have adverse effects on agriculture (Nieróbca 2009). Reduced productivity of some crops may result from heat stress and deteriorating water balance. Increasing temperature may also promote the development of heat-loving weeds, pests or the emergence of new plant diseases. Changes in the start and end dates and length of the growing season, in addition to the consequences for plant ecosystems, may lead to a long-term increase in carbon storage, and changes in vegetation may affect the climate system (Linderholm 2006). The aim of the study was to identify the thermal and precipitation conditions in the growing season in Poland in years 1966–2015 and to determine changes in the above conditions in the analysed multi-year period. The study was based on daily values of average air temperature and daily precipitation totals for 1966–2015 obtained for 30 stations in Poland (Fig. 1). The data were provided by the Institute of Meteorology and Water Management—National Research Institute. Based on the above data, the start and end dates of the growing season were determined. A period with an average daily air temperature ≥ 5 °C was considered as a growing season (Carter 1998; Skaugen and Tveito 2004; Linderholm et al. 2008; Szyga-Pluta 2011; Żmudzka 2012; Radzka 2013). The mathematical formulas proposed by R. Gumiński (1948) were used to determine the growing season’s start and end dates. The number of days calculated on the basis of the above formula is added to the 15th day of the month preceding the threshold temperature. If the desired number is greater than 15, when adding, one should consider the actual number of days in a given month. The obtained date is the beginning or end of the separated period. The above method is commonly adopted in determining growing seasons and thermal seasons (Skowera and Kopeć 2008; Szyga-Pluta 2011; Kępińska-Kasprzak and Mager 2015; Czernecki and Miętus 2017). It was also used for the variability of seasons in individual years by Kossowska-Cezak (2005). Kępińska-Kasprzak and Mager (2015) compared the thermal vegetation period determined by the method of Gumiński with those determined by the method of Huculak and Makowiec (the latter consists in calculating the accumulated series of deviations of average daily air temperature values from appropriate threshold values) for the period 1966–2005 in Poland and they discussed the possibility of their use to determine the beginning and end of the growing season. They stated that in long-term datasets, both methods lead to similar results, and suggested their comparison with phenological observations and/or vegetation indicators obtained by satellite remote sensing. Bartoszek and Siłuch (2015) showed a significant accordance between average vegetation period onsets as determined by both the Gumiński and remote sensing methods in the decade 2001–2010. In the next step, the average air temperature, the sum of the air temperatures and the sum of precipitation in the growing season in each year were calculated. The actual length of the growing season in particular years was taken into account to calculate these characteristics. Subsequently, the changes in the beginning and the end of the growing season and changes in the air temperature and precipitation totals in the analysed multi-year period were determined. The Mann–Kendall nonparametric test was used to determine the statistical significance (p < 0.05). In addition, for selected seasons, anomalies of monthly precipitation totals were calculated. Anomalies were calculated as the difference between the monthly precipitation total in a given year and the average monthly total from the multi-year period. The thermal conditions were then determined using the thermal classification developed by Lorenc (1994). In this classification, the thermal assessment shall be based on the relationship between the average temperature of the season and the corresponding average value for the multi-year period increased or reduced by a multiple of the standard deviation (Table 1). In turn, the assessment of precipitation conditions was based on the precipitation classification developed by Kaczorowska (1962). In this classification, the precipitation assessment is calculated on the basis of the percentage of precipitation in a given season over the multi-year average (Table 2). In the years 1966–2015, the growing season in Poland on average started on 26 March and ended on 7 November. The growing season started from the south-west to the north and northeast of Poland (Fig. 2a). The beginning of the period was recorded the earliest in Słubice—18 March and the latest in Suwałki—7 April. In turn, the end of the growing season was from the north-east to the south-west and the coast (Fig. 2b). The end date of the analysed period ranged from 25 October in Suwałki to 16 November in Hel and Łeba. The obtained data indicate that the growing season started the earliest and ended the latest in south-western Poland, while it started the latest and ended the earliest in north-eastern Poland. It follows from this that the vegetation period was the shortest in north-eastern Poland (on average < 209 days), whereas in south-western and western Poland it was the longest (average > 238 days) (Fig. 2c). The average length of the growing season for the entire research area was 227 days. Over the course of the analysed multi-year period, the growing season started progressively early, although significant changes occurred only in northern and north-eastern Poland. On the other hand, the end of the growing season occurred later and later. The recorded changes were statistically significant in the majority of the country except for the north-eastern regions, the Świętokrzyskie Mountains and the Lublin Upland. The consequence of changes in the beginning and end of the growing season was that it became longer, with the maximum extension occurring on the coast. Except for two stations in the south of the country, the changes were statistically significant (Fig. 3). The dates of the growing season’s beginning and ending, and its length are very variable from year to year. However, the average start date in Poland had a greater tendency to move earlier through the research period, while the end date end occurred progressively later at a slower pace. Hence, the length of the growing season tended to become longer throughout the period. The average air temperature in the growing season in Poland in the years 1966–2015 was 13.1 °C. In the majority of the country, the average air temperature was relatively even and was in the range 13.0–13.6 °C (Fig. 4a). An air temperature below 13.0 °C was recorded only on the coast. The course of the average annual air temperature shows considerable year-to-year fluctuations, although this variation is similar within the analysed area, as evidenced by the small variance of the standard deviation values, which range from 0.5 °C at seaside stations up to 0.8 °C in Suwałki. Based on the average air temperature for the whole area, it was found that the coldest season occurred in 1978, during which, 43% of the stations experienced their lowest air temperature for the whole multi-annual period. The average air temperature for the whole area was 11.7 °C. In the analysed season, north-eastern Poland and the Kashubian Lake District should be considered the coldest regions (Fig. 4b). The lowest air temperature was recorded in Suwałki, at only 11.0 °C. On the other hand, it was the warmest in the west, south-west and south of the country, and the highest air temperature was recorded in Poznań (12.2 °C). At 63% of the stations, the coldest seasons occurred in the decade of 1976–1985, while in the next 10 years, the 1990 season was equally cold. However, the warmest season was found in 2011, with an average air temperature of 14.0 °C. This season was the coldest in northern Poland, especially on the coast (Fig. 4c). The lowest average air temperature was recorded in Hel (12.8 °C) and Łeba (12.9 °C). On the other hand, the warmest regions were found in central, western and eastern Poland, where the air temperature exceeded 14.0 °C, and its highest values were recorded in Poznań and Słubice (14.6 °C). The 2011 season was the warmest season in the analysed multi-year period for ten stations. At 83% of stations, the warmest growing season occurred after 2000, and at 16 stations, it has occurred in the last 10 years. An increase in air temperature during the growing season was observed in Poland, although not everywhere was the increase statistically significant (Fig. 4d, 5). Apart from northern Poland and the vicinity of Płock and Białystok, the observed changes were statistically significant at a level of at least 0.05. The highest increase in air temperature was recorded in southern Poland, with the maximum in Rzeszów (0.26 °C/10 years) and Kraków and Wrocław (0.25 °C/10 years) (Fig. 5). The average sum of temperatures in Poland during the growing season was 2979 °C. Its highest values were recorded in south-western Poland, where it exceeded 3200 °C (Fig. 6a). The lowest sums were recorded in north-eastern Poland and the Kashubian Lake District, below 2700 °C. The coldest, in terms of the sums of air temperature was the 1980 season, with a mean sum of 2510 °C. The highest sums were recorded in the south-west of the country, where they exceeded 2600 °C (Fig. 6b). In contrast, the coldest regions included north-eastern Poland, the Kashubian Lake District and the Świętokrzyskie Mountains. In that season, 24 stations had their lowest sum of air temperatures of the whole multi-year period. At the same time, this season was one of the shortest of the whole study period for most stations, and the very shortest for seven stations. The warmest season, on the other hand, was recorded in 2014, with an average sum of 3429 °C. In Poland, the thermal conditions were significantly diverse (Fig. 6c). As in the case of the coldest season, the highest sums were recorded in the south-western and western regions of the country, where they exceeded 3800 °C, while in north-eastern Poland, they did not exceed 3000 °C. In the above-mentioned season, 17 stations experienced their highest sum of air temperatures of the entire multi-year period. At most stations, this season was one of the longest seasons in the years studied, and at three stations, it was the very longest. In the examined period, a statistically significant increase in sums of air temperatures in Poland was found (Fig. 6d). The smallest changes took place in north-eastern Poland with a minimum in Białystok, 57.5 °C/10 years (Fig. 7). Much more significant changes occurred in western and southern Poland, and their maximum was found in Wrocław at 123.4 °C/10 years. Based on the thermal classification developed by Lorenc (1994), it was found that normal conditions prevailed in the analysed years (Table 3). On the basis of averaged data for the whole area, it was stated that normal seasons constituted 48% of all seasons. Over the last 20 years, there has been a noticeable increase in slightly warm and warm seasons, with no season being below normal. The last season that was colder than average occurred in 1991. Thermal conditions at individual stations differed slightly from the average. The most frequent occurrence of normal conditions, the share of which ranged from 36% in Chojnice to 56% in Rzeszów, is their common feature. In the years 1966–1995, colder seasons were visibly more frequent than warmer seasons, and their ratio ranged from 9:10 in Płock to 4:13 in Kalisz. In the aforementioned 30 years, significantly colder seasons were recorded in 1974, 1977, 1978 and 1990, which were generally classified as very cold, anomalously cold and even extremely cold seasons in the eastern regions of the country. One can also distinguish the seasons clearly above the standard in the analysed multi-year period, among others, in 1975, 1983, 1988, 1992 and 1995 perceived mostly as slightly warm and warm as well as occasionally very warm seasons, e.g., in Hel, Łeba (1975), Opole (1983, 1988), Suwałki (1992) and Świnoujście (1966). In all stations, there was a marked increase observed in the frequency of seasons above normal in the past 20 years, with a simultaneous decrease in seasons falling below normal. In the aforementioned multi-year period, in addition to the frequently occurring slightly warm, warm and very warm seasons, there were also anomalously warm seasons in Białystok (2010), Chojnice (2003), Kalisz (2007), Kielce (2003), Lesko (2007), Słubice (2011), Suwałki (2003) and Toruń (1999). In spite of significant warming, seasons below the standard have also been recorded in recent years. Against the background of the last 20 years, the season of 2015 is distinguished in particular, which, in north-western Poland above all was classified as slightly cold, cold and even very cold in Hel and Łeba. In the years 1966–2015, the average seasonal precipitation total in Poland during the growing season was 430.4 mm. The highest precipitation totals were recorded in southern and northern Poland, while the lowest was in central regions (Fig. 8a). The course of seasonal precipitation totals shows large fluctuations from year to year. This variability is diverse in the examined area, as evidenced by the standard deviations, which range from 72.7 mm in Gorzów Wielkopolski to 112.4 mm in Racibórz. Based on average precipitation totals for the entire area, it was found that the driest season occurred in 1982, with an average total of 281.6 mm. This season was driest in the Wielkopolska Lakeland and the eastern part of the South Pomeranian Lakeland, and the lowest rainfall total was recorded in Poznań at only 168.4 mm (Fig. 8b). A precipitation total below 200 mm was also recorded in Chojnice (195.9 mm). On the other hand, the highest amount of rainfall in this season occurred in the south-eastern regions of the country with the maximum in Lesko, which was as many as 459.0 mm. In the 1982 season, nine stations experienced their driest season of the analysed multi-year period. By analysing the particular months of the season, it was found that, at 23% of stations in the whole season, there was less precipitation than the average for the multi-year period. However, at most stations, the rainfall was higher than average in June and May. The largest deviations above the average were recorded in June in Lesko (60.1 mm) and Hel (58.9 mm) (Fig. 9). The remaining months were dominated by less precipitation than the multi-year average, and the largest deviations below the average were generally observed in July and September. The maximum deviations exceeded 60 mm and were recorded in May in Lesko (63.6 mm), in July in Toruń (64.5 mm) and Warsaw (63.6 mm) and in September in Kołobrzeg (62.9 mm) and Łeba (68.5 mm). In turn, the wettest season was found in 2010, with the average total being 599.6 mm. The lowest amount of rainfall was recorded in the Lower Vistula region, with the minimum in Elbląg, where the seasonal total was 393.7 mm (Fig. 8c), while the highest precipitation was recorded in the south-eastern regions, with an average of over 700 mm and the maximum in Lesko (878.8 mm). In this season, 13 stations experienced their wettest season of the analysed multi-year period. Looking at the individual months of the 2010 season, it was found that, in the early spring and the autumn months, the rainfall was generally lower than the multi-year average. The largest deviations below the average were recorded in June in Gorzów Wielkopolski (61.0 mm) and Elbląg (50.9 mm). Deviations significantly above the multi-year average were observed mainly in May, August and September. The maximum positive deviation was 223.2 mm in May in Kraków. More than 100 mm was found in May in Lesko (135.8 mm), Lublin (104.7 mm), Opole (169.4 mm), Racibórz (132.2 mm), in July in Rzeszów (105.9 mm) and in August in Słubice (189.4 mm). The change in precipitation in Poland in the years 1966–2015 is on average high from year to year, but the multiannual increase is not significant (Fig. 8d). In the years studied, an increase in precipitation in the growing season was observed at most stations (Fig. 10). Changes were statistically significant only in Świnoujście at 22 mm/10 years. In the other coastal stations, a slightly smaller increase was observed (from 14.9 mm/10 years in Łeba to 16.6 mm/10 years in Hel), although it was significantly higher than in the rest of the country. A reduction in total precipitation was found in the area extending from the Silesian Lowlands and Kraków-Częstochowa Upland through central Poland to the Masurian Lake District. Based on the precipitation classification developed by Kaczorowska (1962), it was found that normal conditions prevailed in the analysed years (Table 4). On the basis of averaged data for the whole area, it was stated that normal seasons constituted 48% of all seasons. Next were dry (26%) and wet (20%) seasons. Against the background of the multi-year period, the years 1986–1995 were distinguished, as they featured no seasons with the sum of precipitation above the norm, while four seasons were below the norm. Similar conditions were observed in 1996–2005 but in those years one season was found to be above the norm, while only two were below the norm. In the analysed 50-year period, there were one very dry season (1982) and two very wet seasons (1974, 2010). Precipitation conditions at individual stations were similar to the average in Poland. As a rule, seasons were classified as normal and their percentage ranged from 20% in Świnoujście to 48% in Gorzów Wielkopolski. In most stations, the seasons with above-normal precipitation totals occurred most rarely in 1986–1995. Then, single seasons in several stations could be classified as very wet; the very dry seasons occurred much more often. In the analysed multi-year study, extremely dry seasons were observed at some stations in 1971 (Terespol), 1982 (Chojnice, Poznań, Rzeszów) and 2015 (Racibórz). The seasons classified as extremely wet occurred much more often, and these were recorded in 1966 (Kielce, Racibórz, Rzeszów), 1967 (Poznań), 1968 (Racibórz), 1972 (Mława, Płock), 1974 (Lublin, Terespol), 1977 (Mława, Racibórz), 1978 (Olsztyn), 1980 (Chojnice, Toruń), 2001 (Chojnice, Kielce, Płock) and 2010 (Kraków, Opole, Płock, Rzeszów, Siedlce, Słubice, Toruń, Warsaw). In the years 1966–2015, the growing season in Poland on average started on 26 March and ended on 7 November—earliest in the south-west and the latest in the north and north-east. The end of the growing season took place earliest in the north-east, progressing to the south-west and along the north coast. Over the analysed period, the growing season started increasingly early; meanwhile, the end of the growing season was later and later. The recorded changes were statistically significant in the majority of the country except for the north-eastern regions, the Świętokrzyskie Mountains and the Lublin Upland. Results of Nieróbca et al. (2013) show a similar tendency. The increase in the length of the growing season in different regions of Poland was also confirmed by other authors, among others, Żmudzka and Dobrowolska (2001), Kożuchowski and Degirmendžić (2005), Olechnowicz-Bobrowska and Wojkowski (2006), Skowera and Kopeć (2008), Kijowska (2010), Krużel et al. (2015), Tylkowski (2015) and Graczyk and Kundzewicz (2016). A similar trend of changes has also been observed in other temperate regions, inter alia, in Scandinavia and Finland (Carter 1998; Irannezhad and Kløve 2015) and China (Song et al. 2009). The thermal conditions of the growing season changed clearly in the analysed multi-year period. In the area of Poland, there was an increase in air temperature during the growing season. Apart from northern Poland and the vicinity of Płock and Białystok, the observed changes were statistically significant at a level of at least 0.05. The highest increase in air temperature was recorded in southern Poland, with the maximum in Rzeszów (0.26 °C/10 years) and Kraków and Wrocław (0.25 °C/10 years). A similar trend in most analysed stations in north-eastern Poland was noted by Radzka (2014), where in April, July and August significant changes in air temperature were recorded. The highest increase in this parameter (from 0.6 °C to 0.8 °C per 10 years) was observed in April. According to Radzka (2014), in stations in the east of the examined region, a significant temperature increase (from 0.3 °C to 0.5 °C per 10 years) also occurred in October. A significant temperature increase occurred, among others, in the warm part of the year and translated into a prolongation of the intensive growing season and a significant increase in thermal resources during the period of active growth of plants (Żmudzka 2012). The increase in temperature at the beginning of the growing season is the reason for the early phenological stages in Poland (Jabłońska et al. 2015). Skaugen and Tveito (2004) forecast a prolongation of the vegetation season due to the expected increase in air temperature in the warm mid-year by 2015. On the other hand, based on mesoscale data from the Beskids and Foothills, Bochenek et al. (2013) observed a slight downward trend in air temperature (− 0.05 °C/year) during the growing season. At all stations, there was a marked increase in the frequency of above-normal seasons in the past 20 years, with a simultaneous decrease in seasons falling below normal. There was also a statistically significant increase in total air temperatures in Poland. The smallest changes took place in north-eastern Poland with a minimum in Białystok, 57.5 °C/10 years. Much more significant changes occurred in western and southern Poland. Precipitation conditions in the years 1966–2015 did not change so much. Precipitation totals are characterised by high temporal variability. Żarski et al. 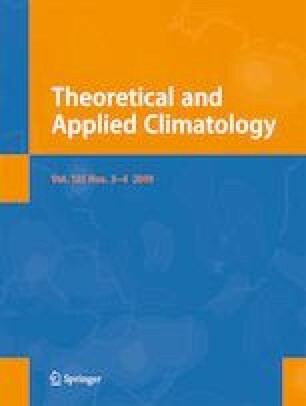 (2014) find that the greatest variability occurs in August and the authors stress that it causes a climatic risk to growing plants. In the years under study, the increase of precipitation in the growing season was observed at most of the stations. However, the changes were statistically significant only in Świnoujście (22 mm/10 years). The remaining coastal stations recorded slightly smaller increases, albeit much higher than in the rest of the country. According to Żarski et al. (2014), a significant trend in the increase in precipitation in Bydgoszcz in the period of 1981–2010 was found only in May. A reduction in total precipitation was found in the area extending from the Silesian Lowlands and Kraków-Częstochowa Upland through central Poland to the Masurian Lake District. During the growing season in Poland, normal conditions prevailed in the period considered. Extremely dry seasons were observed at some stations. The seasons classified as extremely wet occurred much more often. There were no statistically significant changes found in the studied years. In conclusion, it should be stated that in the growing season in Poland in the years1966–2015, there were more significant changes in thermal conditions than in precipitation conditions.